Today I am featuring the shop of stacirose ~ this store carries a wide assortment of original, one of a kind items. You'll find a little bit of everything, including oil paintings, jewelry, picture frames and mirrors, Judaica and much, much more! Each item reflects the care and consideration Staci puts into every piece, and her customer's testimonials, which you can find in her profile, attest to the quality of her work. Custom orders are always welcome, so just send any requests to stacirosedesigns@yahoo.com! I've seen this bracelet before as it was already in my favourites ~ it is amazing. Now usually, as my shop clearly shows, I gravitate towards symmetry or repetitive designs. But this bracelet... The easy flow from one colour to the next in this ocean experience piece is striking. The time and care taken to choose each stones is evident in the harmonious and effortlessly perfect design. I want this... badly. Anyone want to buy it for me?? Please? Isn't this flowing flowers mirror cute? The pine frame is painted with white and gold acrylic paint and gorgeous glass rounds are securely glued on in the shape of a sunny daisy. It comes with hardware to hang, so you don't have to worry about that. Staci has a lot of gorgeous beaded jewelry, and it was difficult choosing a few favourites to feature here. This necklace, with it's dark chocolate tones interspersed with soft cotton candy pieces, is simply to die for! Chocolate blush is so stunning ~ brown and pink being an amazing combination! 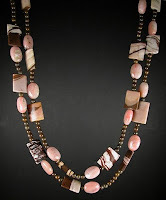 The stones used are zebra jasper, chrysanthemum stone & pink opal ~ please check out this listing if you're interested in finding out what each of these stones signifies. Speaking of beads, have you ever just wanted to get an assortment of standard beads that you could use to get started or to create simple gifts for young girls? 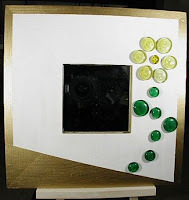 In fact, this bead box would be a perfect gift in itself for a young girl just getting started with beading. I know when I was younger I had a similar box and I filled it with different beads, stringing them to make a beaded curtain for my door and making jewelry for my family and friends. Plus, the lid of this bead box comes personalized with a name and whatever you want ~ animals for the animal lover, sports, girly, whatever you wish! Really, the perfect gift!! Another clever beaded item and gift is these birthstone earrings. The picture shown is simply an example ~ you get to choose the stones you want. The listed price is for 2 to 6 stones, but if they are mother or grandmother earrings with more than 6 stones, you can just add a small extra fee for each additional stone. Great birthday gifts, these would also make a remarkable wedding shower gift, with the bride and grooms birthstones (as well as the anniversary stone, if you want). The design will also be up to Staci and depend on the number, type and shape of the stones, but you are sure to get something spectacular. Do check out the listing for other example of designs and the list of stones to choose from. Please check out this shop, as well as Staci's blog, where she's featuring the wonderful artists taking place in this 90 day challenge!